(although if you register for the Ambush- you'll get a free lunch ticket). There is a tentative work (& shoot) day scheduled for April 1 (no fooling'). More details will come closer to that day. We still need volunteers to write the stages for 2 months. (Take a chance--expand your creativity--put your cowboy fantasies down on paper). Set up for each monthly match will probably be done the previous Sunday. So see how that fits into your schedule for volunteering. Community Day: - usually in July. 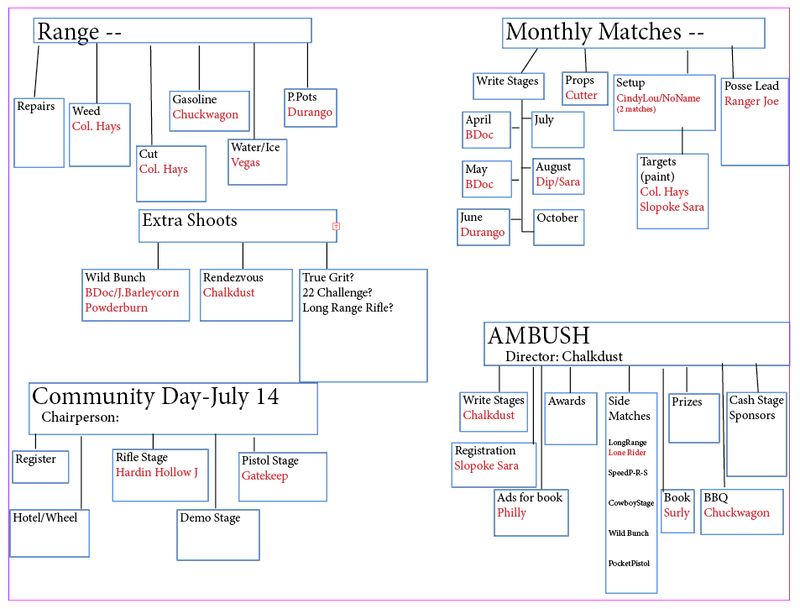 We need a couple more "hands" to help in the rifle and pistol stages, a few cowpokes to put on a "demo" stage, someone to "man" registration, a couple people to run the kids through the hotel (maybe spinning the wheel for penny candy) or shooting marshmallows out of the upstairs windows. We can rotate through these jobs, but we need volunteers. Saturday eve:	Cowboy and Wild Bunch side matches to remain open. Saturday night: Chuckwagon Sam's gourmet cowboy BBQ, campfire and entertainment. Sunday after lunch: Top Gun Shoot off, prize drawings and awards. Besides the 8 stages and free side matches all shooters will get an Ambush novelty, a ticket for a free lunch or breakfast. In addition, the BBQ is free for registered shooters. All shooters have a chance to win the main match prize, a Pedersoli White Hawk Rifle and for those who stay for the awards, their names will be included in the additional prize drawings. NOW the kicker. First of all, we need registered shooters, at least 65. We need volunteers to help with the Ambush. Some folks have to help with side matches, find prizes to be given away and also find some cash stage sponsors (8 or 9 at $100--we already have 2 and a half). If you think you can help with any of those, PLEASE, let Chalkdust know ASAP.